The A6 Bodyshop is equipped with the latest body shop tools and equipment to handle every type of vehicle accident repair from that irritating bumper scuff or small dent, right through to panel replacement and heavy impact damage. Whether your car is just in need of a new coat of paint, or you want to change its colour, we are fully equipped and experienced to do this. Our body shop only uses a variety of compliant paints linked to a system that provides a perfect colour match every time. We exceed all current body shop environmental legislation. As well as respraying and refinishing we also offer a full accident and body repair service for all makes and models of commercial vehicles including vans, light commercial vehicles, minibuses and special purpose vehicles including ambulances. Our bodyshop services include bodywork repairs, panel beating, body spray, full resprays, scratch & chip repairs and accident repair. Our paintshop only uses variety of compliant paints linked to a system that provides a perfect colour match every time. A6 Bodyshop prides itself on its paintshop facilities and experienced paint sprayers who can provide a body panel spray, a full respray or a HGV body spray. We can handle almost any size of commercial road vehicle, including tractor units, rigid vehicles, 13.5 metre trailers and coaches. At our Accident Repair Centre in Westhoughton, Bolton, we are experts in both fault and non-fault claims, dealing with the insurance companies and third parties direct. On the completion of repairs, simply pay us any excess on your policy and drive away your vehicle, returned to you in superb condition. 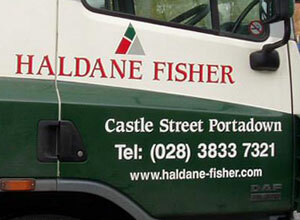 We specialise in car graphics, vehicle graphics, van sign writing, HGV graphics and van stickers. All our vinyl lettering is custom made and comes in your choice of font, size and colour for maximum impact. Our window graphics can be made for interior fit or exterior fit. Not only do we do van sign writing and car vinyl graphics and lettering - but we also do HGV and coach graphics and lettering. "I nearly bought a new car - but after the work, I feel that I already have one!" "I would like to thank you all for a hassle free service and MOT on my car. A much better service than the main dealer I used before." "We can't even see where the scratch was - amazing!" "Just a note to say thank you for doing the bodywork on my MG. You did a fantastic job."